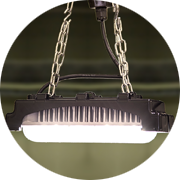 Clear-Vu Lighting’s FLEX system provides safe and sustainable LED lighting for temporary construction sites. 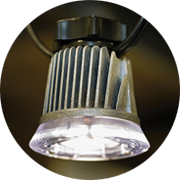 This low-voltage LED System offers an energy-efficient, zero maintenance alternative to traditional incandescent, CFL and HID systems. The LED Modules utilize best-in-class LEDs from top-tier chip manufacturers combined with robust heat sinks to guarantee the life of the product. FM10 and FM30 include 10′ whip standard for ease of configuration, optional on the FM2A (FM2A-6W). The FPS450/FPS450DT/FPS450I power supplies accommodate up to (54) FM2As, (14) FM10s, (6) FM30s, or a combination of the different modules preserving the ratio. The FM2A module produces 5-foot-candles (average) at 10-12 foot spacing.The directed optics of the FM2A provide up to 30% more light on the ground than a 27W CFL lamp, ideal for fit-outs of smaller rooms. The FM10 module produces 5-foot-candles (average) at 20 foot spacing. The FM10 module is ideal for special applications requiring 20′ spacing and/or surface mount (i.e. tunnels). The FM30 module produces 5-foot-candles (average) at 30 foot spacing. The FM30 incorporates proprietary lenses that direct 5-10% of the light upwards, eliminating the cavern effect in projects with high ceilings (above 12′). 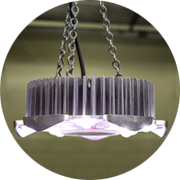 An ideal replacement for traditional 400W metal halide and high-output fluorescent fixtures. 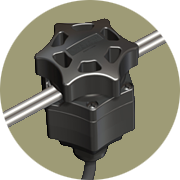 The revolutionary second generation T-Connector comprises an injection-molded nut and twist-base assembly that houses piercing teeth. When the bus line is fed into and secured to the connector, an over-molded rubber channel creates an IP66 seal between the LED module and bus line. No more splices required. Included on all LED Modules (integral on FM2A, on 10′ whip for FM2A-10W, FM10 and FM30).